dog-eating giant otters, and many more creatures that await the unwary. 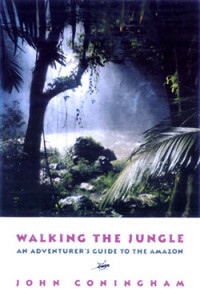 By turns anecdotal and practical, Walking the Jungle tells tales of the jungle and most of its dark secrets. Armchair travelers and true Indiana Joneses will benefit equally from Coningham’s unique expertise on life in one of the most dangerous natural habitats on earth. John Coningham is a Brazilian novelist and teacher whose resume includes stints as an Army officer, cattle rancher, hunting guide and construction boss. He lives inBrazil.